Is there a better alternative to Memonote? Is Memonote really the best app in Applications category? Will Memonote work good on macOS 10.13.4? 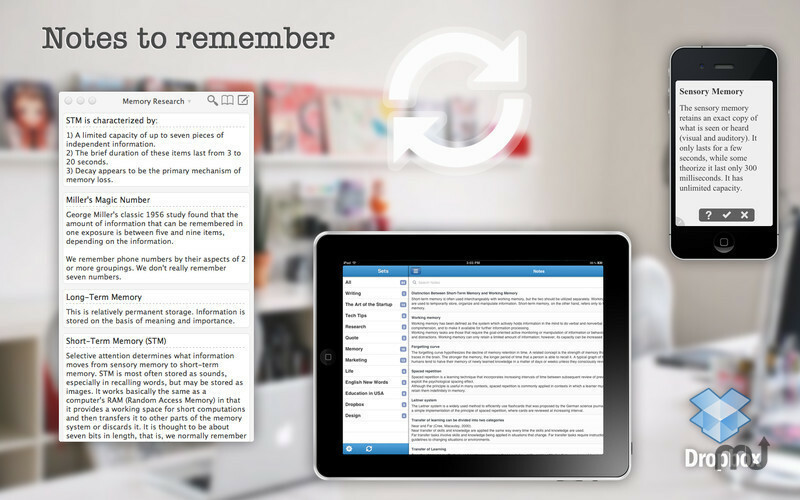 Memonote helps you achieve your goals with fast note tracking and easy studying. Each day we aspire to do good work and learn something new. Its human nature to strive for growth. What comes between most of our dreams and our success rate is the amount of focus and persistence. It goes without saying that the more you learn. the greater your chances of success. Simple and elegant notebook interface, theme support. No unnecessary features. Just jot down what you want to remember. Global keyboard shortcut support. start a new card note as easy as it should be. Quick add note with one keyboard press (use Apple Script): check help.memonoteapp.com for details. Sync bug after Sandboxing on 10.7+. Show note created date and set name. Memonote for iOS 4.3 or later. Keep new note window always on top or keep it open after save for fast making multi note cards. Easier to Organize: A good set of notes on a topic will be easier to add into Memonote filing system. Search quickly through all your note in a fraction of a second. Spaced Repetition for long term memory. Custom font size and alignment. Study in full screen, no disturbing. Export to CSV, It's easy to make flashcards from csv format file. Upload csv to gflashcards.com, for example. When you find something you want to remember, put it in Memonote.